Roberts Gallery had the privilege of being the exclusive dealer for A.J. Casson from 1955 until his death in 1992. The painter and designer A.J. 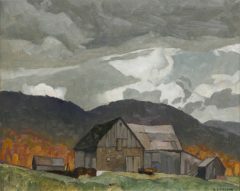 Casson, younger than other members of the Group of Seven, became a full-time artist only on retirement from his successful commercial career. His art distills Ontario’s farmland and forests into highly finished, carefully composed designs, with a stillness that sometimes seems ominous. Casson studied art in Hamilton Technical School in 1913, and with Alfred Howell and Harry Britton at Central Technical School in Toronto (1915-1917). He apprenticed with the artist Frank Carmichael at Rous & Mann in 1919, following him to Sampson & Matthews in 1927. Through Carmichael, Casson met his mentors, the Group of Seven, at Toronto’s Arts and Letters Club. He later sought to escape their influence. Casson’s design career was crucial to his art. An accomplished calligrapher, he excelled in streamlined design, loved pattern, and developed an exceptional visual memory. Casson co-founded the Canadian Society of Painters in Watercolour in 1926. He promoted Canadian art through his commercial work and arts organizations, instigating the WWII war artists program. He visited Britain in 1961. Alfred Joseph Casson worked in commercial art firms from the age of 15, becoming a full-time artist only when he retired in 1957, as Vice-President and Art Director of the Toronto firm of Sampson & Matthews. In 1926, Casson had replaced Johnston as a member of the Group of Seven. He painted mostly in watercolours until the 1950s. In the 1930s he concentrated on Ontario villages (Summer Sun , 1940; Anglican Church at Magnetawan, 1933). The dramatic lighting of his mid-1940s landscapes gave way to superimposed forms and light broken into planes from the 1940s-1950s. In his later paintings, he reduced forms to two-dimensional patterns. Born in Toronto, Ontario. His father was born in England and his mother in Canada. His family moved to Guelph when he was nine. There he roamed the countryside storing an appreciation of nature which he would later draw upon as an artist. His family moved to Hamilton in 1912, and there he stud­ied under John S. Gordon at the Hamilton Technical School. At the age of 16 he was apprenticed to the Laidlaw Lithography Co. in Hamilton where he retouched photographs, laid patterns and engraved on zinc plates (1913-14); he then was hired by Commercial Engravers Company in Hamilton (1914-15). When his family moved back to Toronto in 1915 he worked as a free­lance designer. Evenings he attended the Toronto Central Technical School under Alfred Howell (1915-17); OCA under J.W. Beatty (1918-21); and pri­vate classes under Harry Britton who first taught him water colour tech­niques and introduced him to oil painting (1916-18). In 1919 he was employed by the firm of Rous & Mann Ltd. as assistant designer to Franklin Carmichael, serving a seven-year apprenticeship (1919-26) which led him back to the field of freelance designing. During this period he benefited greatly from Carmichael’s high standards in daily work and became a good friend and sketching companion of his demanding but friendly boss. Through him he met members of the Group of Seven at the Arts and Letters Club. During their early weekend trips Carmichael helped Casson with colour and choice of subject, as a result he moved toward a freer style using more colour. 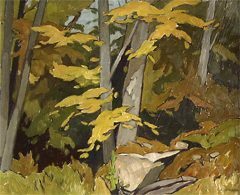 In 1921 Casson made his first extended painting trip with Carmichael to Lake Rosseau in the Muskoka District and exhibited for the first time with the OSA. In 1923 his canvas Clearing was purchased by the NGC. The painting was based on a sketch done at Lake Rosseau. While working in oils he was also developing his water colours and in 1925 with Carmichael and F.H. Brigden, formed the Canadian Society of Painters in Water Colour, to encourage and foster the art of water-colour in Canada. In 1926, Carmichael, coming from a get-together at Lawren Harris’ home, related to Casson that the Group had agreed between themselves to invite him to become a member of the Group of Seven due to the departure of F.H. Johnston who wanted to pursue his own agenda to paint more realistic scenes acceptable to the buying public. In 1926 too, Casson started work for the firm of Sampson-Matthews. Weekends he continued to sketch with Carmichael. F.B. Housser wrote in the Year Book of Arts in Canada, “Carmichael and Casson are painting in water colours . . . giving to Canadian landscape a statement in water colour as bold and untraditional as that which some of their associates have given in oils.” Many of Casson’s large canvases were done between 1926 and 1930 when he sketched in the Haliburton region and Lake Superior areas. The emergence of his individu­ality in 1924 was noted by Paul Duval, as was later his change in style (1944) when pattern became the vital element in his work. It was about 1924 that Casson focused on the Ontario village. 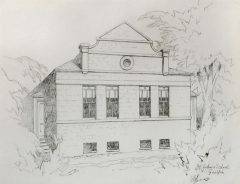 He made many pencilled and painted sketches of structural details which became a valuable reference for his larger studies in oils, like his magnificent Anglican Church At Magnetawan (1933), purchased by the NGC in 1936. A fall while skating in 1924 agitated a kidney stone and he was advised by his doctor not to sketch outdoors for a year. Undaunted by this restriction he spent weekends paint­ing flowers in the greenhouses of the Allen Gardens. From this period he produced a series of small glowing panels of flowers and still lifes. Perhaps some of Casson’s attention to design might have been due to his growing interest in various types of reproduction. Vice-President and Art Director for Sampson-Matthews Limited for almost 20 years, he was responsible for the technical development of programmes in connection with reproduction of artists’ works carried out by the National Gallery of Canada, Canadian Pulp and Paper Association and Sampson-Matthews Limited. 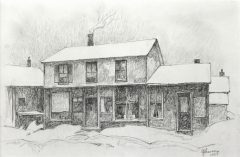 His article entitled The Possibilities of Silk Screen Reproduction appeared in Canadian Art in 1949 in which one of his own prints Mill Village was reproduced. His heraldic work was also reproduced by Sampson-Matthews, including armo­rial bearings of Canada and her ten provinces, and a series of landscapes including, White Pine (McM. Coll. ), Fisherman’s Point (McM. Coll. ), Summer Morning, McGregor Bay and Poplar. 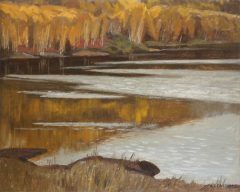 His paintings of northern Ontario landscapes and villages won him several awards. He was a prolific artist. He did many small sketches in oils on panels in various sizes espe­cially 9 x 11 and down to 8 x 5-1/2. He once destroyed many of these small sketches found in a forgotten box when cleaning out his basement. They were not up to his standards achieved in later years. Only a few were saved for friends. 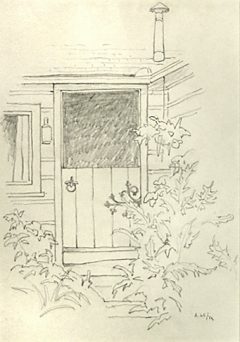 Some public collections have a good representation of these small sketches including that of the late Professor O.J. Firestone of Ottawa. 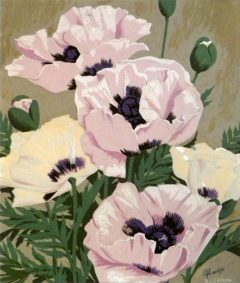 He faithfully acquired 138 works covering Casson’s entire painting career from 1918 to 1976, and later donated the O.J. Firestone Collection to the Ontario Heritage Foundation in 1972. Bob and Signe McMichael assem­bled their magnificent McMichael Conservation collection of Art (McM. Can. Coll.) in Kleinburg, Ontario, which included 45 or more Casson works. Their collection was also donated to the OHF in 1965. Casson produced many fine larger works as well which include: Clearing (1923) NGC; Summer Sun (c. 1940) NGC; Crescendo (1953) SPL&AG, Sarnia; Calm after Storm (1952 ) MMFA; and many more in private collections. Two of his favourite paintings were Mist, Rain and Sun LRA&HM, Lond. and Roof Tops owned by Ken Thompson. He lived in his north Toronto home with his wife until his death at the age of 93. He was survived by his wife and daugh­ter. He was not only one of Canada’s most able artists but also one of the most highly regarded. He is represented in many public Canadian collec­tions including: NGC, Ott. ; AGO, Tor. ; McM. CAC, Kleinburg; HH, U. of T.; AGH, Hamilton; LRA&HM, Lond. ; Gallery Lambton, Sarnia; MMFA, Mtl. ; and many private collections. Affiliations: ALCT (1921); CPE (1922); OSA (1923) Pres. (1941-45) Life Mbr. (1968); Fdn. Mbr. CSPWC (1925); G of 7 (1926); ARCA (1926) RCA (1939) PCRA (1948-52); Fdn. Mbr. CGP (1933-61). Honours: Cent. Medal (1967); Hon. LL.D., U. West. Ont., Lond. (1970), LL.D., U. of T. (1975); O.C. (1978); D.F.A. Mt. Allison U., Sackv., N.B. (1980); LL.D., McMaster U., Hamilton (1982).